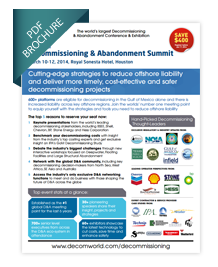 Get complete insight into the world's leading Decommissioning & Abandonment Summit 2016 here! The D&A Summit is the industry's largest and most influential business conference & exhibition for the decommissioning industry. Simply complete your details to the right to get the 2016 conference brochure sent directly to your inbox. Details of all the leading operators, including Chevron, ExxonMobil, BP, Shell and more that are participating in the 2016 Summit - and the cutting-edge operator insight that you will hear! Take an in-depth look at all 20+ crucial decommissioning debates - covering susbea well P&A, cost estimation, pipeline decommissioning, rigs to reefs and more! Complete overview of the 3 cutting-edge workshops, gala dinner and 3 track conference program - giving you a complete picture of the decommissioning market in 2016 and beyond! Learn how operators and contractors are doing business with the low oil price to develop secure short-term and mid-term strategies. DecomWorld is a trading name of FC Business Intelligence Ltd.
Get your copy of the world-leading Decommissioning & Abandonment Summit brochure now! If you have any specific questions regarding the 2016 Summit, please feel free to get in touch.